For what opened on a latterly conceived spur between the original North Kent Line and the branch of the London & Greenwich Railway, the layout here was surprisingly extensive. If the Royal Observatory’s opposition to the railway had not been an obstacle, the SER would ideally have taken its 1849-opened North Kent Line through to the Greenwich terminus of 1840, rather than assuming the circuitous route it was compelled to, via Blackheath and Lewisham. 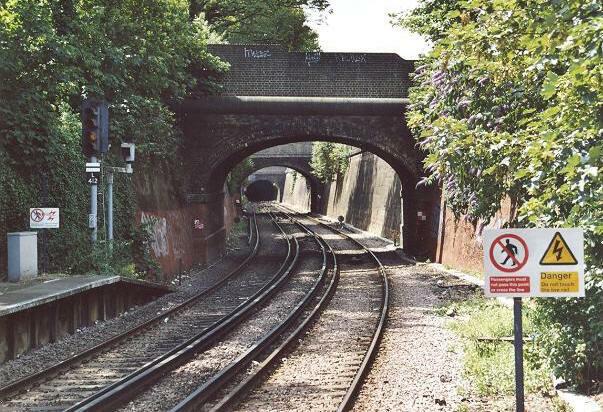 Latterly, the Royal Observatory relaxed its restriction on railway incursion, which allowed a double-track spur between Charlton and Maze Hill to be opened on 1st January 1873. The final push to Greenwich was not completed until 1st February 1878, however, and even this was single-track from the outset. In retrospect, this was a somewhat unusual station owing to a number of features. Despite being situated on what was fundamentally a connecting spur between a pair of hitherto separate lines, Maze Hill commanded no less than three platform faces, two of which constituted an island, the latter sitting to the immediate north of the double-track running lines. The side platform face, to the south of the running lines, was host to the main building, and this itself was an oddity. It was built to the same design as that which later opened at Halling in 1890 (and of which is still in existence). Constructed in the thick of the SER’s ‘’economical’’ clapboard era, Maze Hill was one of few stations at the time to receive the brick treatment, but in spite of this, the railway company was evidently keen to standardise. Therefore, brick the building may have been, but its walls were clad with clapboard to deceive the eye! Adjoined to the eastern elevation of the main building was a single-storey clapboard extension, which had the appearance of a SER-designed signal cabin which had lost its base. To have the station purporting an economical look by use of timber cladding may seem unusual, but the main structure was not without some finesse; an intricately patterned canopy was incorporated. The fundamental design of this was akin to the example at Plumstead, with the gradual upward-sloping roof, but the valance was instead identical to that which can still be seen at St Johns. 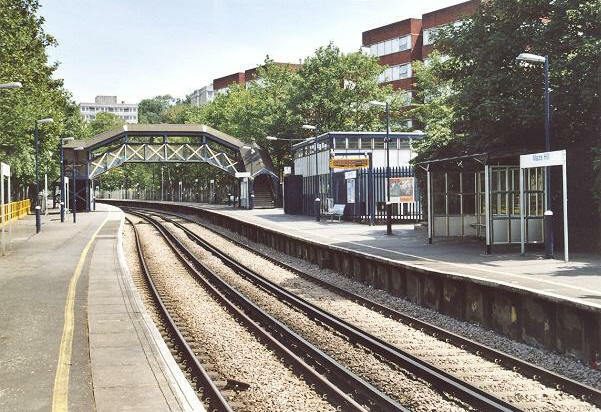 The island platform canopy was instead arched in nature, like the examples at Paddock Wood, but it was decorated with the same valance design as that used on Maze Hill’s ‘’up’’ side. A lattice footbridge, positioned to the west of the main station building and island canopy, linked the platform surfaces. Neither Greenwich nor Maze Hill stations were hosts to goods facilities, but the latter did play one important role, aside from serving passengers: that of carriage storage. A large array of rolling stock sidings flanked both sides of the station layout; to the north of the platforms were five westward-facing sidings, in addition to a short eastward-facing stub, and to the south were six eastward-facing tracks. Of interest are the two eastward-facing tracks immediately behind the ‘’up’’ platform, which terminated where the eastern elevation of the station building began. This pair of tracks were provided with protection from the elements in the form of an arched roof spanning the majority of their length - an identical structure was later installed over two of the ‘’down’’ storage sidings. Roofs such as these were also features of both Blackheath and Woolwich Dockyard stations, although their existence at the latter two was short-lived compared to the example at Maze Hill. Two signal boxes, to the east and west of the platforms, were commissioned by the SER to independently control the ‘’up’’ and ‘’down’’ sidings respectively. Circa 1908, the SE&CR installed another footbridge, this time a covered lattice example positioned to the east of the station building. The original footbridge remained in use concurrent with this until its removal by the Southern Railway. Under the latter company, there were also signalling modernisations: the most western signal box was subject to decommissioning on 4th February 1934, the remaining cabin to the east taking over its functions. Maze Hill was not the first station along the route to lose a signal cabin; Plumstead and Gravesend Central stations each lost such a structure in 1926 and 1928 respectively. Despite the installation of third rail in 1926, the extensive carriage sidings around Maze Hill’s platforms remained, but these were never electrified, thus were host only to locomotive-hauled rolling stock. It becomes apparent that this station was the recipient of World War II bomb damage. By the time Maze Hill had passed into British Railways ownership, half of the main building was no longer in existence and a number of canopy struts on the ‘’up’’ side had been strengthened. The western third of the island canopy had also disappeared, leaving just the struts which once supported the cladding. By the time ten-vehicle electric formations had commenced in 1957, the carriage shelter on the ‘’down’’ side had been dismantled and one siding lifted, and by the full completion of the Kent Coast Electrification in 1962, all such storage tracks had gone out of use. In spite of this, the remaining two-storey high all-timber mechanical signal box of SER design, continued to control the rationalised layout until the St Johns Panel took over on 29th November 1969. To those interested in bygone railway architecture, this closure would have been the least of their worries, for worse was to come. In early 1971, the somewhat patched-up, but nevertheless interesting station, suffered fire damage, which prompted a near complete rebuild. All structures, except the 1908 covered footbridge, were obliterated, and the island was converted to a standard side platform. The then new ‘’up’’ side ticket office was a single-storey rectangular all-glazed structure, and this became the first of its type to be trialled by British Rail as a ''modern-image'' suburban station on the South Eastern Division. The new station was deemed formally complete on 14th July 1971. A ticket office identical in design appeared at Chelsfield three years later, and a much larger example came into use at Dartford during the same era. A ''bus shelter'' was installed at the bottom of the footbridge’s flight of stairs, on the ‘’down’’ side. The former site of the ‘’up’’ side carriage sidings was given over to the development of blocks of flats, and the vacant land on the ‘’down’’ side was similarly sold off for conversion to residential property. 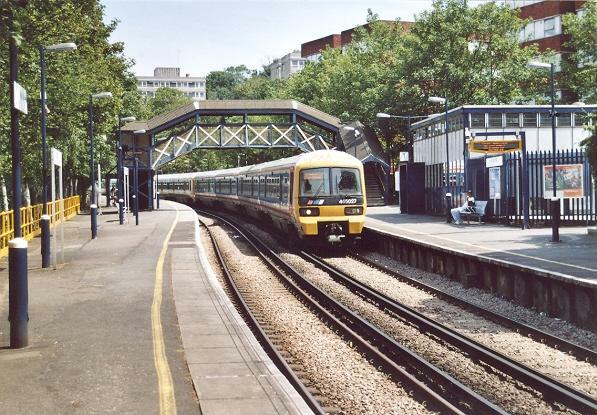 The platforms were lengthened at their eastern ends in 1992 in connection with the twelve vehicle ‘’Networker’’ scheme and, finally, in 2005, a waiting shelter appeared on the ‘’up’’ platform, just to the west of the main station building. This westward view from 3rd July 2006 is reminiscent of the easterly exit from Gravesend Central.